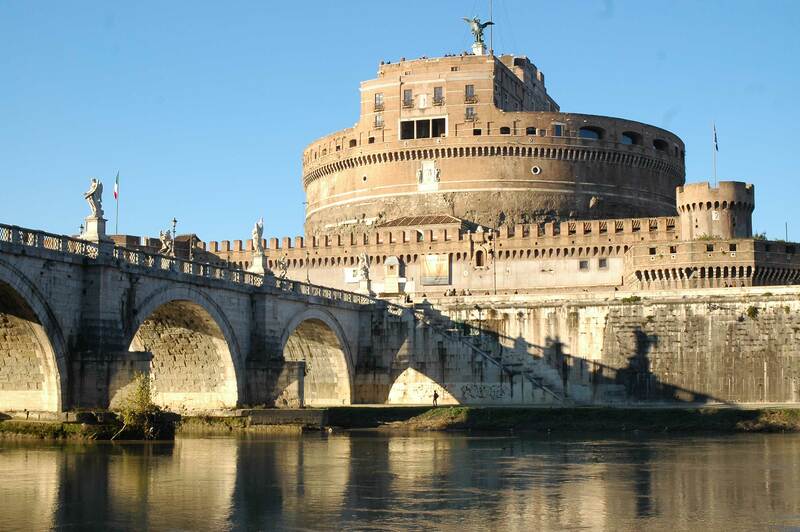 If you like to visit Castel Sant’Angelo, a bed and breakfast in the centre of Rome is the best solution for a holiday dedicated to art and entertainment. Castel Sant’Angelo stands in the district of St. Peter’s, at one end of the Ponte Sant’Angelo bridge, on the right bank of the Tiber. The structure was originally a mausoleum. It had probably been commissioned and built by Hadrian as a tomb for himself and for his successors. The work was initially undertaken by the architect, Demetrianus, around the year 123. It was completed by Antoninus Pius a year after the Emperor’s death. Since 1925, the structure has hosted the Museo Nazionale di Castel S. Angelo and its historical and arts collections, including relics and other objects of interest regarding the Italian Army, in a monumental setting restored for this purpose. At certain times of the year, the famous “Passetto di Borgo” or “er Corridore” (the corridor) – the fortified and elevated passage on the Mura Vaticane (Vatican walls), linking the Vatican to Castel Sant’Angelo – is open to visitors. With this corridor, leading directly to the castle from the Palaces of the Vatican, Popes were provided with an escape route to the fortress in times of particular unrest. The fortified structure also permitted control of the surrounding district. If you are looking for a bed and breakfast near a metro station so thay you can easily reach any area of ​​Rome, do not hesitate to contact us. It’s very easy to get Piazza del Popolo from Vatican Rooms Cipro. It’s sufficient to get Cipro station and go straight to the Vatican Walls to Piazza Risorgimento. After reaching Piazza Risorgimento, get Via Stefano Porcari and then Via Giovanni Vitelleschi. Alternatively you can get bus no. 913 to 8 stops and get off at Piazza Cavour. From here, crossing Piazza Adriana you can reach the gardens and then Castel Sant’Angelo with a 400 meters’ walk.